Glad to have my workbench in a usable state, so I thought I’d make the first video for this blog series. 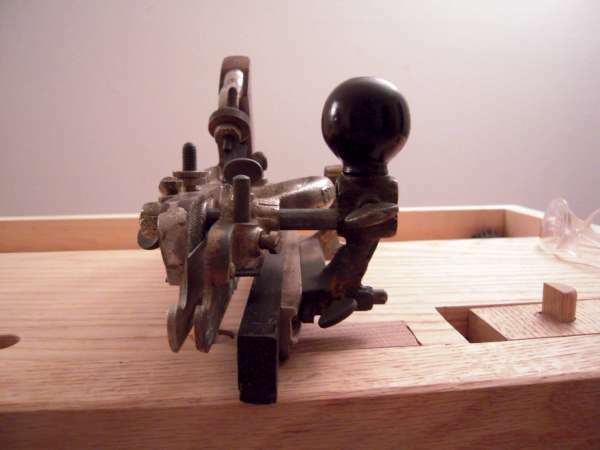 In this blog entry, I will be using my Stanley #45 plane to cut a groove along the face of a board. For the purpose of this example I am using a scrap piece of pine. I am using a 1/2” cutter, and have the depth stop set up for 3/8”, as well as the fence 3/8” away from the edge of the cutter. I am using the second skate in addition to the main body for this. 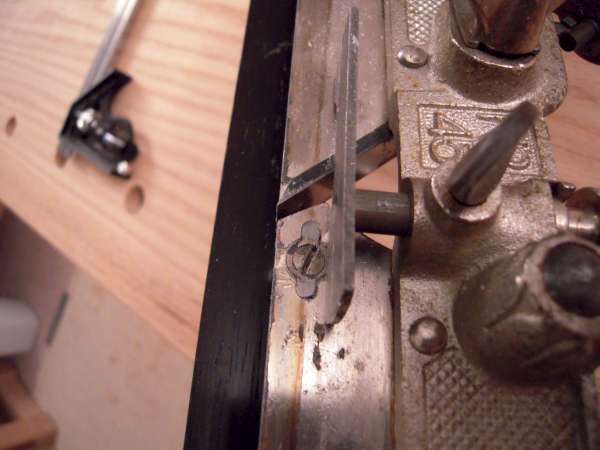 This is not necessarily required for a cutter that is this narrow, according to some of what I read, but I find that it helps me to keep the plane perpendicular to the work piece. Anything wider than 1/2”, and I would recommend using the skate, as it prevents the cutter from twisting. In harder woods, I would also recommend using the second skate on cutters 1/4” wide and larger. And of course, the video on the subject. Thanks for checking it out. I look forward to creating the rest of the videos I hope to make. Great series, video, and detailed information for reference. Should prove very beneficial to those who own a plow like this Stanley, unfortunately I do not. However, I do have a wooden plow, and I find your postings very interesting. Thanks. 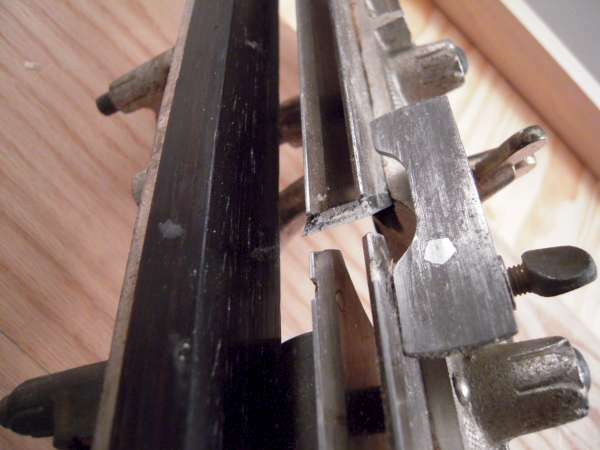 The thing about measuring distances from the fence (for instance) on the #45… Assuming you’re using the tool to cut a dado that will be matched on another board (or set of boards making up a carcase, for example), make all dados at the same time, while the tool is in this setup, and measurements don’t matter. Thanks for all the tips, Mos! I just THOUGHT a 45 looked intimidating…then I got a SW in the original box. I can’t even assemble the tool without the .pdf I downloaded! :) But, that’s sorta like meeting Photoshop for the first time…very powerful program…too many feautures to learn without experienced help! Good stuff, thank you Mos. Great video, everything is spot on in my experience. Have you tried the hollow and round yet? I have a Stanley 45 that belonged to my wife’s grandfather that I want to use, but wasn’t sure how it all worked. Now, I have an idea! Good video Mos, look forward to seeing more. So nice to see the #45 in action without the workbench rocking! Question: wouldnt there be an advantage to setting the work piece flush with the bench? Wouldn’t that give the fence more bearing surface? I purchased a Stanley 45 on Ebay some time ago and only tried to use it once on oak. This plane does take some time to set up and understand how to use. Roy Underhill used this plane on his show several times and did a good job explaining how it works. Looks like you are pretty efficient with this plane. Thanks. Oldtool thanks, I’m sure some of the techniques can transfer over to the wooden plow planes; specifically in regards to the actual planing techniques. Terry Thanks man, I was thinking about doing a video at some point to just go through assembling disassembling, and adjustments. Mauricio Thanks, it’s so nice to not have to waste energy fighting with the workmate… I have tried it that way, before, but I use the fence in the upper position, so the fence rides on the workpiece even after the cutter is most of the way through. When I tried using ti against the bench, I found that if there was any movement in the workpiece it would throw it off. Thanks for posting the video. I picked up a #45 at a swap meet a while back. I haven’t tried using it yet because the screws securing the nickers are absolutely frozen in place with the blades up. But now that I know they aren’t needed on long grain planing, I’ll give it a shot! Thanks Brian. I will use the knickers in some long grain work, but very rarely. More often than not I would forget to disengage them and the next time I used it, the knickers would leave nice big grooves in my work piece when making a rabbet, or something. I’ve had issues with them in oak when I was too lazy to take the time to disengage them. They’d get in the grain and push it off track. Not the best results. Alright, so unless one is working across the grain, the nickers are a detriment. Good to know! Now I can’t wait to get home and try it out. Thanks Terry. I was sort of in the same boat the first couple times I tried it with the nickers in long grain. It was rather frustrating. I really appreciate and am enjoying all the information and instruction that you are producing/compiling regarding the #45 Mos. And i am with Mauricio in liking that fact that you now have a much more accommodating surface on which to display your skills; too cool. I am missing the secondary depth stop for my #45, is that something that will be a necessity for some tasks? i.e. do i need to start looking for one?